Mr. Vladimir Putin, the Russian president, is bound to meet with German Chancellor Angela Merkel today to discuss conflicts in Ukraine and Syria, as well as the controversial Nord Stream 2 gas pipeline which US President Donald Trump criticized during his NATO meeting in Brussels a few months ago. However, it is his stopover in Vienna, Austria, that has everyone surprised. 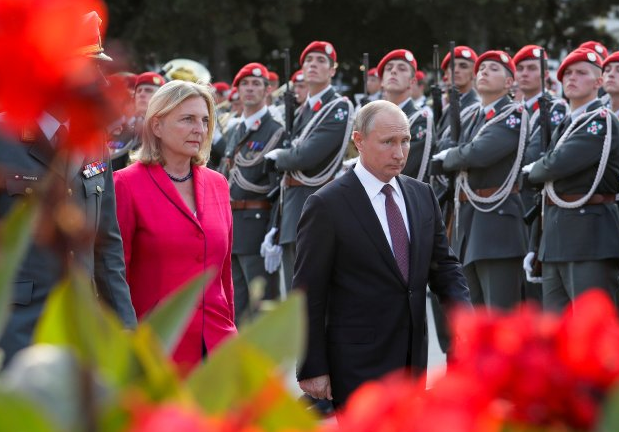 Mr. Putin, accompanied by a Cossack choir which he brings along as a gift, is set to attend the wedding of Austria’s foreign minister, Ms. Karin Kneissl, who is bound to wed entrepreneur Mr. Wolfgang Meilinger at a vineyard in Styria state before going to meet Ms. Merkel. Ms. Kneissl is an independent politician from the industrial background who was selected for the position by Austria's far-Right Freedom Party, one of the two parties in Austria’s coalition government. During a visit to Austria earlier this year, where the two met for the first time, Ms. Kneissl invited Mr. Putin to her wedding which the latter accepted. The Austrian media has been buzzing with excitement ever since the Kremlin confirmed Mr. Putin would be in attendance. Austria’s opposition parties have expressed their surprise at the arrangements, with Social Democrat’s Mr. Andreas Schieder exclaiming: "How is Austria's presidency of the EU meant to live up to the government's own claims of building bridges and being an honest broker, when Austria's foreign minister and chancellor are so obviously on one side?" Most of the anger, however, came from Ukrainian politicians, who are hoping the EU, which Austria holds the rotating presidency of in this year half, would mediate in their conflict with Russia. Austrian Prime Minister Mr. Sebastian Kurz will also be a guest at the wedding.